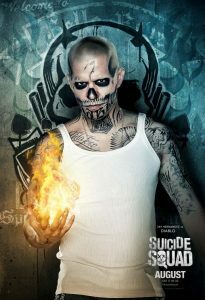 After David Ayer’s impressively realistic war film, Fury, it was announced that he would be directing the highly anticipated and edgy superhero film, Suicide Squad. Assembling an international cast would be easy. Will Smith, Margot Robbie, Joel Kinnaman and Oscar nominee Viola Davis were all on board but the real casting coup was having Oscar winner Jared Leto (Dallas Buyers Club) play the Joker. 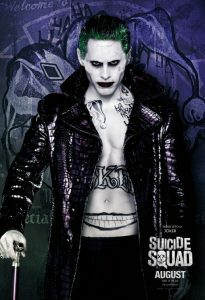 Big crazy shoes to fill for Leto considering Oscar winner Heath Ledger did such a sterling job of playing The Joker in Christopher Nolan’s visually impressive The Dark Knight in 2008. And then there was Oscar winner Jack Nicolson’s wacky portrayal of Gotham’s most deranged villain in Tim Burton’s Batman back in the 1989. So Suicide Squad is finally released with huge expectations including a brilliant trailer but is this new superhero film that mind-blowing? 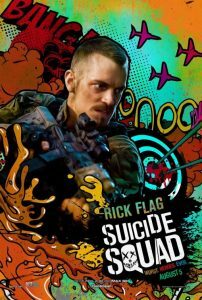 If viewers watch this film as a precursor for Warner Bros’s DC Comics expanding their cinematic universe following Batman versus Superman and the highly anticipated The Justice League to be released in 2017, then Suicide Squad will satisfy fanboys globally. 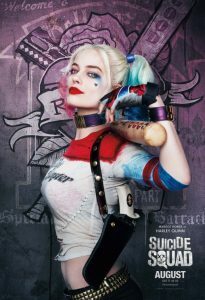 What saves Suicide Squad is Margot Robbie’s exuberant performance as the psychopathic killer Harley Quinn who also happens to be The Joker’s deranged girlfriend. 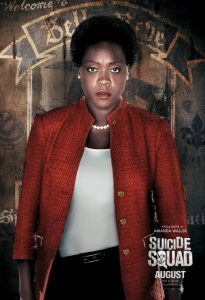 Equally good in Suicide Squad is Oscar nominee Viola Davis (The Help, Doubt) who plays a hard-nosed and ruthless head of a covert government organization and the brainchild behind assembling such a crazy bunch of humans and meta-humans to save Midway City, where the only bond tying the psycho killers together are a shared lunacy and the prospect of continued incarceration. 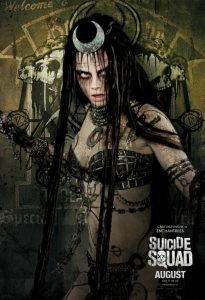 What works against Suicide Squad is having such a young villain, model turned actress Cara Delevigne as the evil Enchantress whilst Leto’s crazy Joker has diminished screen time, but then again Leto is returning in The Justice League, so we shall see. Suicide Squad does lose the plot slightly, but as a superhero film especially with David Ayer at the helm, it could have been far edgier and definitely much sexier. This is where Deadpool got it right. 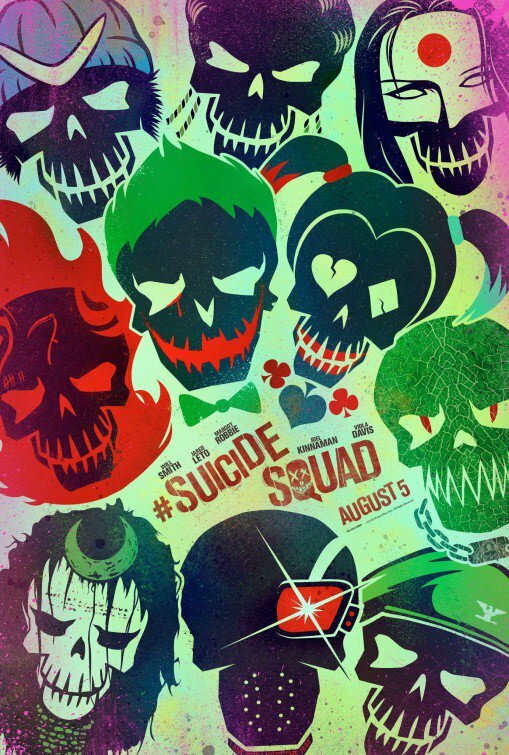 If you are going to subvert the superhero genre do it properly especially with such a deranged cast of characters. The use of continued flashbacks in the narrative also detracts somewhat from the primary storyline. 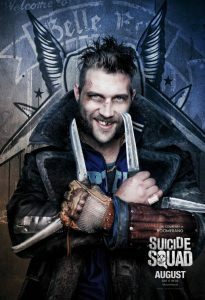 Despite the steam punk production design, Suicide Squad is not a brilliant film and certainly does not live up to its hype, but will be savoured by all superhero fanboys and if one views the film as a precursor to great things to come then it is outrageously entertaining. Audiences should definitely stay seated beyond the final credits. 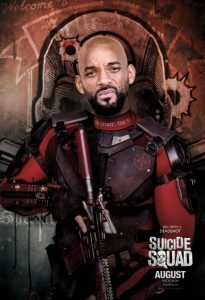 Unfortunately Will Smith and Joel Kinnaman seem to fumble in the film but that is primarily because they do not have sufficiently grittier and bloodier material to work with, a style which director David Ayer is more accustomed to. See Fury to appreciate where Ayer’s real talent lies. End of Watch director David Ayer tackles the war genre in the brutal drama simply entitled Fury assembling a stellar cast of great young actors including Shia LaBeouf last seen in Lars von Trier’s Nymphomaniac, Logan Lerman, Michael Pena (End of Watch, American Hustle) and Jon Bernthal and headed by the illustrious Brad Pitt (Legends of the Fall, Twelve Monkeys, Moneyball, The Counselor). In a role similar to that played in Inglourious Basterds, Pitt plays Don “Wardaddy” Collier, a hardened soldier and Nazi killer who is heading up a tank squadron and who has seen his fair share of bloody battles. The tank in question is called Fury and as the Allies advanced into Germany during April 1945, these American tanks were combating the far superior designed German Panzers. As the brutal end of World War Two winds down, Hitler has ordered every last man, woman and child to defend their country against the advancing Allies. Against this gritty theatre of war, the veteran Collier inherits a young and naive gunner named Norman Ellison superbly played by Logan Lerman who to his dismay went from being a typist in the US Army to manning a machine gun in an armoured tank. Its Collier’s job to toughen Norman up, even forcing him to shoot an unarmed German soldier as he brandishes pictures of his family to the American troops and desperately pleads for his life. As the five man team who drive Fury further into the German countryside, the situation gradually deteriorates as they first enter a German town obliterated by shelling casually coming across a suicide party of Nazi officers along with a scattering of scared German villagers and then near a farmhouse in the muddy countryside where they encounter an enemy infantry division marching towards them. This is grim viewing with lots of bloodshed, superbly choreographed action sequences and unrelenting violence, cinematically brought to life with razor sharp sound effects, giving the viewer the sense of being involved in these gruesome final battles. As opposed to George Clooney’s Monuments Men, David Ayer’s Fury deglamourizes war to its basic instinctual premise of kill or be killed and with excellent sound editing and effects, the film stands as a perfect counterpoint to The Imitation Game which elegantly showed war as a complex game of ingenuity and skill, clouded with espionage and intrigue. 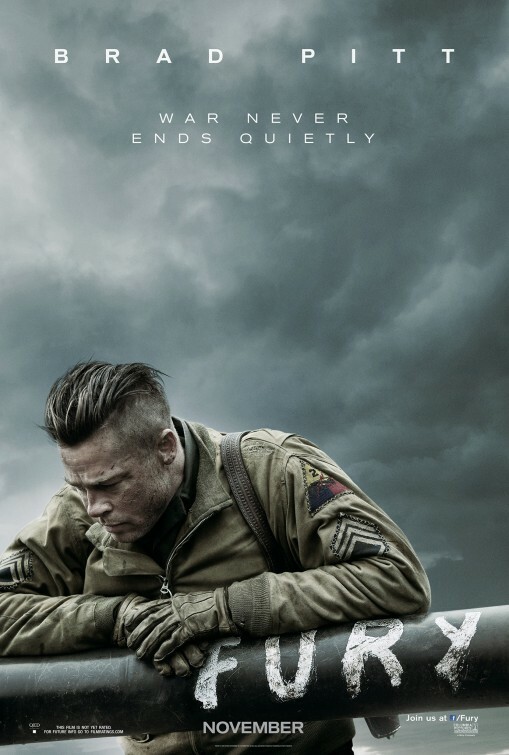 Fury goes straight to the bloody and dirty heart of war and in its tag line aptly states that no war ends quietly. This is man fighting man with all the brutal savagery one has for each other’s enemies, as the victors march through the lands of the defeated. 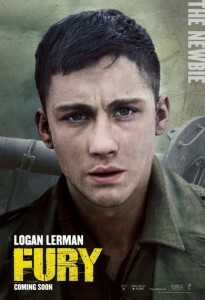 Fury is well acted especially by Logan Lerman (Noah) in one of his more substantial roles and definitely alludes to a talent waiting to be nurtured. The rest of the four man team adds a brave complement to Norman’s emotional and physical journey as a very young soldier who realizes he has to go to any lengths to stay alive. Fury will definitely appeal to war film enthusiasts and those viewers that enjoyed Saving Private Ryan, Lone Survivor and even the more stylized Quentin Tarantino war film Inglourious Basterds. American director David Ayer has excelled with Fury which is highly recommended viewing aimed at a mature masculine audience that can appreciate the art of combat and the innate savagery of war itself. 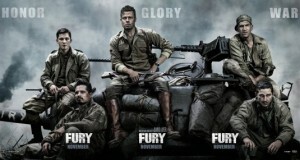 Fury is not for the squeamish and certainly not for those expecting a light hearted war romp like The Monuments Men.